If you didn’t get your TV fix on Black Friday, don’t worry because the single best deal of Black Friday 2018 is still available today. Let;s just call it Cyber Friday 2018! 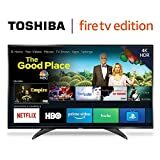 The Toshiba 55LF621U19 55-inch 4K Ultra HD Smart LED TV HDR – Fire TV Edition is easily among our favorite new TVs of the year. It offers great picture quality and stunning 4K resolution with HDR support, and it has Amazon’s awesome Fire TV software built right in. It’s a true bargain at $500, but it’s still available on sale for Cyber Friday for just $399.99. Serious, you can’t afford not to get this deal. Dimensions (W x H x D): TV without stand: 49.1” x 28.7” x 3.7”, TV with stand: 49.1” x 30.2” x 12”. Multiple device input/output options: 3 HDMI including 1 with ARC, USB, composite input, digital output (optical), antenna/cable output, audio output, Ethernet.